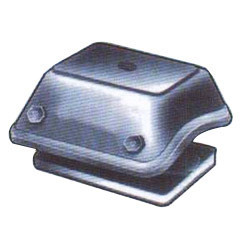 We offer an extensive range of spring mounts mountings that are extensively used for diverse industrial applications. Our range of Polybond-GMT Double ‘U’ Shear Mountings is highly durable and heat resistant. These are carefully engineered and feature a soft vertical spring rate. Designed using optimum quality raw material, our double 'U' shear mountings are capable of damping shocks 8 vibration in vertical as well" as in lateral direction. Offered in compact design, it offers protection against metal to metal bottoming. Looking for Shear Mountings ?